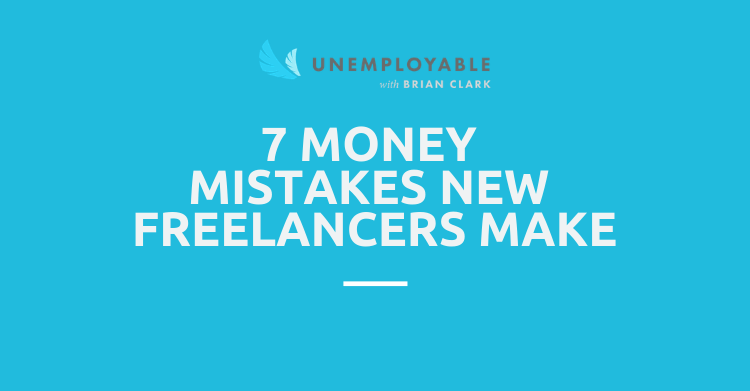 There are tons of money mistakes freelancers regularly make, especially at the beginning of their career. In this article, we’re going to discuss a few of the most common mistakes and how you can either avoid them or fix them. We’re not going to use a lot of complicated financial language and convoluted money solutions, so you’ll finish reading this post feeling more empowered than ever to tackle those pesky dollars and cents problems. At least, that is the goal. If you want to take charge of your financial situation and improve your money management skills, you’ve come to the right place. Mistake #1: You don’t have separate personal and business bank accounts. If you just caught yourself saying, “Yikes, that’s me,” in your head after reading that, rest assured this isn’t a personal attack. Many freelancers fail to separate their bank accounts because why would you? You didn’t have to do that at your old 9-5 job, so why would you have to now? Having one account that you pay your bills with and get payments directly deposited into sounds convenient, but it makes for a nightmare when it comes to tracking expenses, recording income, and saving for taxes. You see, as a freelancer, you are your accounting/finance department in addition to all the other work on your plate. Don’t make it harder for yourself come tax time. Solution: Create a separate business bank account (this is the one your payments will be deposited into) and a separate tax bank account (this is the one you’ll use to save for taxes). From there, have all your payments sent to your business bank account—not your personal bank account—and take a percentage of each invoice and move it to your tax account. After the money transfers, pay yourself, pay your bills, and tuck some money away into your savings account. Dividing your bank accounts into personal, business, and tax accounts will make managing your cash flow infinitely easier. Not to mention, if you’ve registered your business as an LLC or plan on doing that in the future, the only way you remain protected is if your payments are deposited into a business bank account. Mistake #2: You don’t save for taxes regularly. Saving for taxes isn’t as challenging as one may think. Let us explain. Because you aren’t paying taxes on each invoice you send, you owe the good ol’ government that cash at some point or another. If you don’t start putting money away consistently, you may find yourself scrambling to make those payments. The answer is so simple and is one that lets you put that money away, so it’s out of sight and out of mind until tax time. Solution: Remember that tax account you opened up? Start stashing away 25-30% of every invoice you collect into that tax account. That’s it. That’s all you have to do to ensure you’re covered when Uncle Sam knocks at your door. By putting money away in an entirely separate account from your personal and business funds, you are operating as though you don’t have that money at all. It never touched your other accounts, so you never have to worry about having enough money to cover what you owe. Mistake #3: You aren’t using a business credit card. Does weeding through bank statement after bank statement trying to nail down your business expenses and record them either in an Excel spreadsheet or in your accounting software sound like your idea of fun? Well, maybe for some it does. But if you’d rather avoid that situation at all costs, get yourself a business credit card. Solution: There are tons of options when selecting a business credit card, so don’t skimp out on your research. Find a credit card that has bonuses or rewards that work in your favor—like travel miles or cash back. Mistake #4: You rely too heavily on one client as your main source of income. We get it—finding quality clients that understand your value is a challenge in and of itself. But if one of your clients disappears, and they happen to be the bulk of your income, that could cause some problems. It’s essential to have a few steady sources of income, that way if something doesn’t work out with a client or if your contract ends, you aren’t scrambling to pay your bills. Read: Don’t put all your eggs in one basket when it comes to your money. Solution: Make a list of each client you have and how much (on average) they pay you every month. Identify your highest paying and lowest paying clients, and if you have the bandwidth, reach out to your lower paying clients to see if they have additional work they can send your way. The goal here is to even out the money you receive from each client a little more so that way if one were to disappear, it wouldn’t be such a drastic cut. Of course, you don’t have to make the same amount with each client, but evening the playing field a bit more may put your mind at ease. Pro Tip: Contribute to your savings account every month—treat it like another bill!—so you have a rainy day fund in case of emergencies. Mistake #5: Your current cash flow system isn’t cutting it. Clients are late in paying invoices. Banks need a few days to process transactions and deposits. But your bills are due at the same time every month. Cash flow is a complicated balancing act that requires attention and consistent monitoring. Especially if you have inconsistent payment amounts coming at different times each month, this can get even more complicated. Unfortunately for most freelancers, not everything is as uniform as salaried workers when it comes to getting paid and paying bills. Having a consistent, dependable cash flow system will help you avoid those late fees and keep your credit score up. Solution: Take a look at when your bills are due each month and compare those dates to your payment terms. You may find that a 30-day payment term—or maybe even a 15-day payment term—is doing more harm than good for your business. Consider changing your payment terms so that they align with when your bills are due, and you do not have to rob Peter (your savings account) to pay Paul (your bills). Some clients have their own strict payment terms because they’re managing their own cash flow. But at the end of the day, you have to do what is right for your business. You may encounter pushback on updated payment terms, and if you do, kindly explain to your clients the reason for the change. If they’re a great client, they will figure out a way to make it work for both of you. If they refuse to change and you don’t think you can continue with your current payment terms, it may be time to find a client who will align with you. Mistake #6: You don’t understand your worth (and therefore aren’t charging enough). One of the most familiar songs new freelancers sing is the “I don’t know how to price myself” song. And it’s completely valid. Pricing yourself if you’ve never done so before can be awkward and uncomfortable. How are you supposed to know where to even start with establishing your rates? Solution: There are a few ways to approach your pricing, and the reality is that it’s going to look slightly different for every freelancer based on experience, knowledge, and skill. To start, figure out what others in your industry are charging and use that as a starting block. If you see that a veteran freelancer who has years of experience under their belt charges a certain amount, you can start to gauge where you fall on that spectrum. The tricky part here is not to sell yourself short. Just because you’re brand new to freelancing doesn’t mean you don’t deserve to make a living. Be reasonable when it comes to assessing your skills and experience, and you’ll land on an appropriate rate. Remember, the idea isn’t to stick to a rate forever once you set it. You should be raising your rates every few months or when you gain new skills that warrant more money (because you’re bringing more value to the table). Use this equation to help you establish where you should be—because the last thing you want to do is not charge enough to cover your bills! Mistake #7: You’re deducting the wrong items on your tax return or aren’t deducting anything at all. You’ve likely heard “deductions” and “taxes” in the same sentence before, probably even before you started freelancing. However, if you aren’t quite sure what we’re talking about, keep reading. You’re spending money on education, office supplies, professional development, and countless more items as you try to better yourself and grow your business. But as a freelancer, you get to deduct certain items—like the ones listed above—on your tax return. This means that your taxable income is lowered, and as a result, your taxable liability is reduced, too. That sounds wonderful, right? It is, but things can get complicated if you aren’t careful. Solution: Unless you’re all about numbers and solving complex money matters, hire a tax professional or an accountant to either help you make sure you’re on the right path financially (e.g., you’re saving enough for taxes, you’re tracking the correct deductions/expenses, etc.) or to do your taxes for you. There are many deductions you can account for, but to avoid an audit from the IRS and to ensure you’re not leaving money on the table, it’s best to let a professional take the wheel. Also, instead of waiting at the end of the tax year to fork over what you owe, consider paying quarterly taxes instead. This way, your payments are much smaller, and it won’t be as painful to pay such a large sum of money all at once. As a freelancer, you’re responsible for taking your financial matters into your own hands and making sure things are done correctly and in your best interest. Don’t wait until the last minute to teach yourself how to pay taxes as a self-employed person or let your money disappear before your eyes because you didn’t have a savings account. Stay on top of your finances now and the future you will be happy you did. Want more tips on growing your freelance business? Tune into the Unemployable podcast.